Things have been really exciting here in Toronto during the Interior Design Show. The press has been super warm (including a TV plug), other exhibitors really supportive and interest from the stores has been overwhelming! I'll write more (including information on our new products) when I get home (and some sleep) but I just couldn't wait to post up some pictures of the booth. Jen over at Toronto Craft Alert was kind enough to announce our booth (Studio North, Booth 1) at the Interior Design Show to her readers... Have a look at the posting! I also contacted Dana over at dbO Home earlier this week for some information on Trunkt and wanted to post her work here as well. 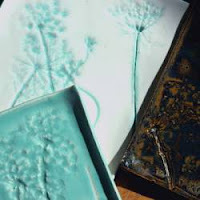 She creates ceramic home accessories with a real organic look. I love her colors, shapes and embossing work. Amazing! I first contacted Shevon Gant earlier this week to ask her about Trunkt. She's super nice and her work is beautiful! 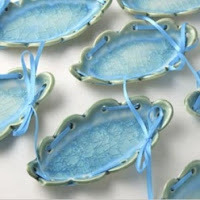 She's a Brooklyn Based ceramic artist and I really love the way she softens up her work with the ribbons. What a unique feature to her work! We're very excited to be working with the wonderful people at David Smith & Co all the way in Seattle, Washington. They carry several of our products, so please visit them if you're in the area! David Smith & Company is located at 1107 Harrison Street in Seattle, 206.223.1598 or visit their website. 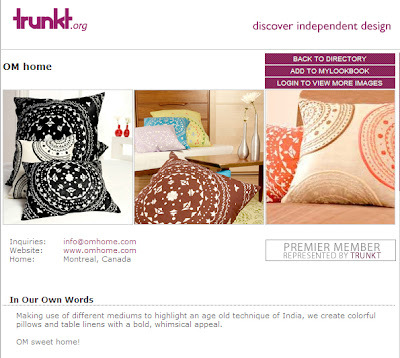 We're very excited to be a premier member of Trunkt. Membership is by invitation only and our products will soon be on sale directly through both their online store and their brick and mortar store in Tribeca. More details to come! In the meantime, check out my page on their site! Mélanie Pratte over at Chocolat Magazine online was kind enough to feature me in her article on cozy cushions to buy online. Here's the article, thanks Mélanie! LOULOU featured OM home in their French version's January/February edition! The same article from December's English issue translated into French. Check it out here. Merci Beaucoup! 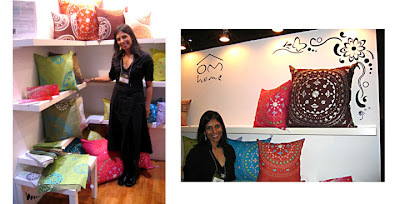 OM home had the honor of three more blog mentions in the last day. It's so exciting to be received so well by the design community, thank you! Toronto Craft Alert is a wealth of information for crafters, independent designers and design lovers alike. Since we're moving to Toronto in a few months, this site has been invaluable to me in getting ready for the move! She was nice enough to list me in her "buy local" links, cool! Love My Earth from a blogger in BC, her slideshow shots are so beautiful!